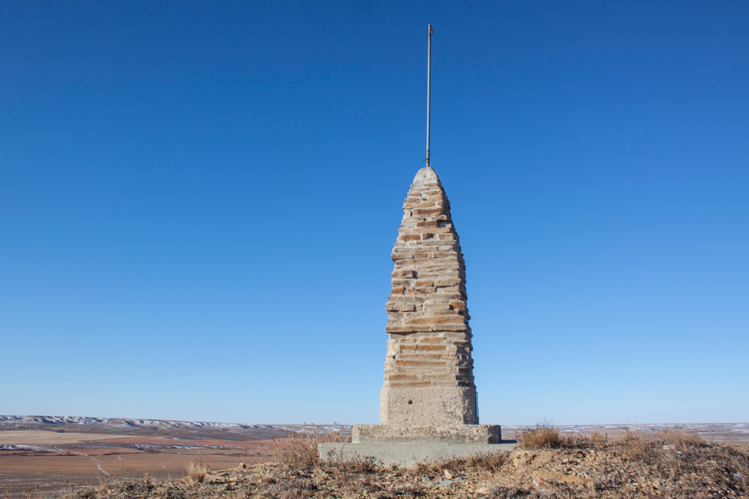 The Silent Guide Monument stands on a lonely hilltop west of Philip. A solitary stone pillar stands atop a knoll known locally as Stoneman Hill, about 8 miles west of Philip on East Grindstone Road. The winds on Stoneman Hill can be fierce and biting cold, but the views from where the Silent Guide stands stoically are copious, reaching southward into the Badlands. Looking northward you might almost sense the smell of a roasted turkey wafting in from a Christmas party held long ago at Pedro Hall. Local lore says the pillar was first built in 1900 by a shepherd named W.S. Jones, to mark the spot of a watering hole. There were Joneses who homesteaded in Haakon County, but neither the U.S. Census of 1900 or the county history Haakon Horizons shed any light on who W.S. was. If a reader knows, please feel free to educate your correspondent. The story goes that the monument often fell victim to the cowboy vs. “honyocker” rivalry. Within a couple of decades, old rivalries gave way to nostalgia for the days before fences hemmed the seas of grass and the local community first rebuilt the pillar in 1924. In 1950, the Silent Guide was designated as a U.S. Coast and Geodetic Survey reference marker. In 1999, the wind-beaten sentinel had again grown weary and the community once more came together to restore the foundation. In 2010, M.R. and David Hansen, who grew up in nearby Grindstone, replaced the brittle mortar holding the stones together. To find the Silent Guide, start west out of Philip on Highway 14 just past where it crosses the north fork of the Bad River. Take a slight right onto E. Grindstone Road. Stay straight for about 8 miles. You’ll see the monument when you reach the top of a steep hill opposite Stoneman.